Intermediate level. Probably the most important musical sequence in modern jazz! 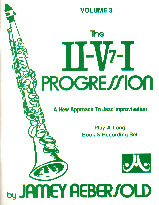 A must for all aspiring jazz players. Book contains all the needed scales and chords to each of the recorded tracks. These are written in the staff. Contains 120 written patterns that can be played with the various tracks on the recording, also includes three full pages of piano voicings that correspond to the tracks on the recording. Booklet contains a Scale Syllabus which allows you to find and use various substitute scales, just like professional musicians use. If you have been working on scales and chords, this book and recording set should be what you are looking for. A new concept in learning and applying basic jazz harmony. Allows you tracks to practice major, minor, dom. 7th, diminished, whole tone, half-diminished, Lydian and dim. whole tone scales and chords.